wants. Perfect fit for our family! I didn't own a dog when I was growing up so this is a new experience for us. Chelle was very consultative with us. They offered great advice on picking our puppy, setting up her home, feeding and training. 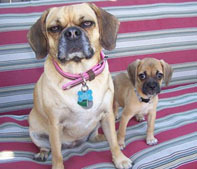 The Puggle book is an excellent resource also. Keyara has truly added lots of laughs and energy to our home. 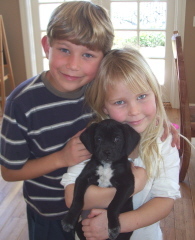 the kids and my first dog and Luna could not have been a better choice. Our children are in love! Thank you Chelle for doing what you do. always been there for us. Her knowledge, professionalism and genuine care for animals reflect all the qualities we were looking for. 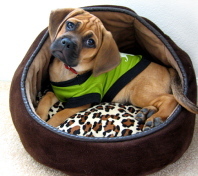 the New Puppy Package has worked for you and your new puppy!! Thanks Chelle for everything you did for us!!! Tucker has already brought so much joy and love to our lives. 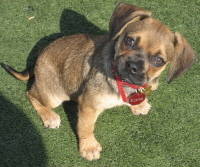 Preston is a wonderful puppy, a cutie and a smarty. We are thrilled to have him in our life and can't imagine a day without him. 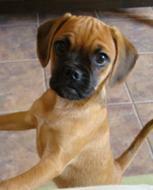 We are glad that we have found Chelle who has a great knowledge on Puggles. 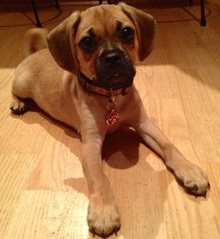 NOTE - THIS IS PROBABLY THE SMARTEST PUGGLE YOU WILL EVER SEE! was also happy to answer any questions we had after we took our Puppy Emma home. your patience with me and all my questions!! " 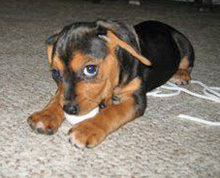 tips, and basic needs for us first time dog owners. We are very fortunate to have found Chelle. Thank you again for having designerdoggies.com you are amazing! major thing we were concerned about was that neither of us had a puppy before. life-saver and we can't thank her enough.